For Buyers, Credit Matters—but How Much? 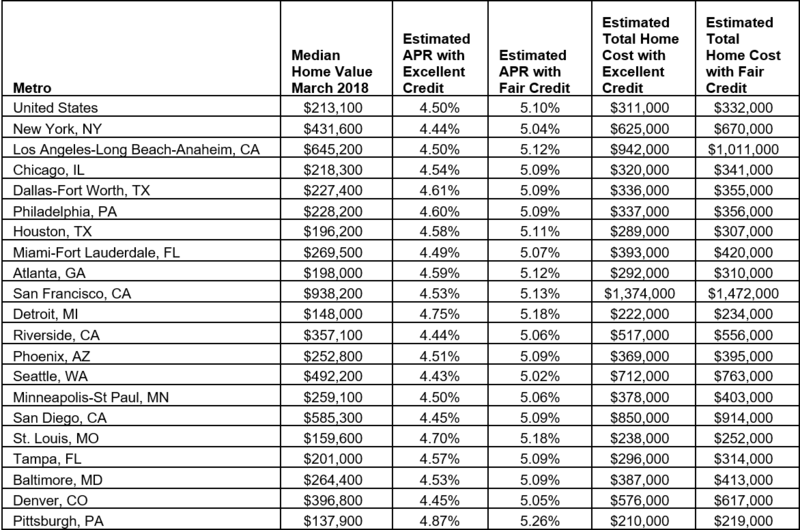 Borrowers not as creditworthy as others often have higher mortgage payments; in fact, according to an analysis recently released by Zillow, the average borrower categorized with credit as “fair” can be on the hook for $21,000 more than a borrower with an “excellent” score. Here’s how: Borrower A has a credit score that’s stellar (“excellent”), and obtains a 4.50 percent rate. Borrower B has a credit score that’s less than stellar (“fair”), and obtains a 5.10 percent rate. If both have a 30-year mortgage and a home with a median price tag, over the course of the loan, Borrower B has $21,000 more to pay than Borrower A. Mortgage rates have risen since the start of the year, recently hitting a point not seen since 2011, according to Freddie Mac.